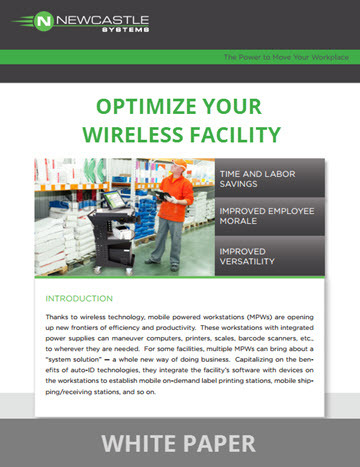 White Paper: "Optimize Your Wireless Facility"
Cutting the cables, going wireless and putting your workplace on wheels has already saved our clients thousands of dollars. Our new White Paper explains why. By significantly reducing foot travel and paperwork, an Mobile Power Solution can have a very favorable impact on your bottom line. In so many enterprises, countless hours are wasted as employees walk back and forth, chatting with co-workers en route, between sites where work is taking place (loading docks, storage racks, assembly lines, inspection/testing areas, etc.) and a desk-bound computer and printer where they log information into a database, print labels/orders, etc. Often, these employees are merely keying in data they have previously written on paper at the work site - a classic redundancy of effort. Or worse, they just rely on their memory, which leads to mistakes. In contrast, an employee operating an MPW has continual, paperless, real-time access to information via warehouse management systems (WMS), enterprise resource planning (ERP), or automated data collection (ADC) software from anywhere in the facility, since the workstation’s computer is always at hand. This is a secure download.